Sometimes the best holidays are the ones where the details come together at the last minute. This is a case in point. Until I started avidly reading travel blogs I have to confess my ignorance about Liguria and the Cinque Terre. My attention was caught by other people’s stunning photos and reviews of this place – I didn’t see a bad one – so on our last minute Pisa trip when I suddenly realised the Cinque Terre was not so far from Pisa it went straight on the agenda. How was this most gorgeous stretch of Italian coastline and its five wonderfully picturesque little hamlets not on my radar? Hidden in tiny coves along the craggy coast these places are delightful in themselves, but add to to that surrounding scenery packed with olive groves, vineyards and woods and you have perfection. Top that with dramatic and harsh cliffs, silvery blue seas and waves crashing on the black rocks and it is better than perfection. It was only relatively recently that they built a road to connect the five hamlets to each other (and the rest of the country). So perfect there’s got to be a drawback right? Well there is – the whole place is packed to the rafters with tourists – definitely not a place to visit in high summer, unless you like (even bigger) crowds. We didn’t encounter any other British tourists, but there are so many German and American people here, sometimes you forget where you are. Rick Steves guidebooks seemed to be a prominent feature – is this his doing? Despite the tourists though and I know this sounds hard to believe, but the hamlets really do remain unspoilt – there are no luxury shops, 5 star hotels or gourmet restaurants. Instead it’s full of casual little places serving the most delicious local cuisine. The highlight of visiting for us was actually getting there. We hiked part of the trail that links the hamlets – a super scenic walk through vineyards with prickly pears, palms and olives everywhere, steps and steep climbs and views to die for. Train was our main method of transport – by necessity rather than design – this is the least scenic way as it mostly involves tunnels. However rough seas meant the ferry was out of action for 2 of our 3 days and thanks to landslides some parts of the hiking trails were shut. Son loved our time here too – the hike and the vast amount of steps to climb on an hourly (never mind daily basis) did not come without moaning and groaning, but we’re used to that and he slept exceptionally well every night! He loved the food, they have gelato here to die for and he actually did appreciate the views (now and then). We were careful to balance time on the trails with time on the beach to keep all members of the family happy. There is something to be said as well for the combination of sea and mountains on the trails – exhilarating and exciting, it means a walk with a difference which although hard going at times was not without fun for our youngest family member. He was fascinated with the foliage and sights along the way, amassed a collection of “interesting” stones and proved to have quite an indepth understanding of olive harvesting – discovered during a random conversation through an olive grove. Sometimes the beauty of a hike like this – your 10 year old will actually have a lengthy conversation about random subjects you never knew he knew about. The scenery is heart stopping, the whole place bursts with colour and sunshine and it is almost unbelievable how much beauty is jam packed into this one little part of Italy. Tourist trap or not we absolutely loved it – one of the most beautiful places I have ever visited. This is a destination I would return to again willingly. It really is stunning, pictures can’t do it justice so I guess you just have to expect the crowds! This trip looks amazing! I have always wanted to go and now it is definitely on my “to see” list. It is one of the most beautiful places you could imagine, photos don’t do it justice! I can’t believe it wasn’t on my list – it is right up there now though on places I want to go back to!! I loooooved the cinque terre! I’m so happy you visited! My husband and I went in late April of 2014 and it was perfect. The villages weren’t too crowded and the trails were bare. If you get a minute, joy, take a look at my post. What hike did you do? 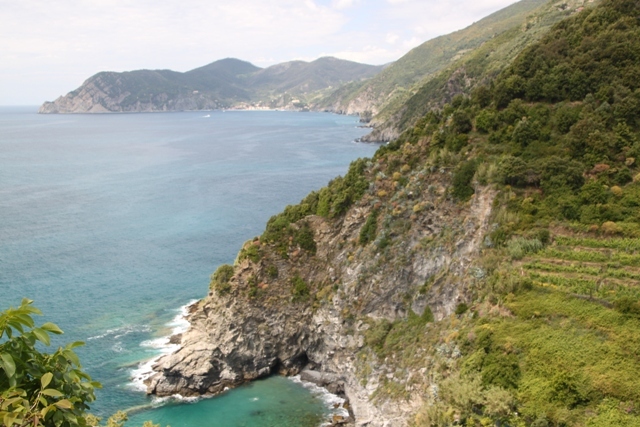 We could only do the first two – monterosso to vernazza and vernazza to corniglia. The other paths were closed. We adored it there too, such an amazingly beautiful spot. We did the same 2 hikes as you but in reverse, hiked from Corniglia to Vernazza and then Vernazza to Monterosso. Again like you we had problems with landslides so the other paths were closed (we were there early June). Shame wasn’t it, but a good excuse to go back and hike the bits we missed!! Going to check out your post right now!! Looks like a great place! The houses remind me a bit of Lisboa, in Portugal. It is just stunning. Never been there (would love to), sounds like it is beautiful too. 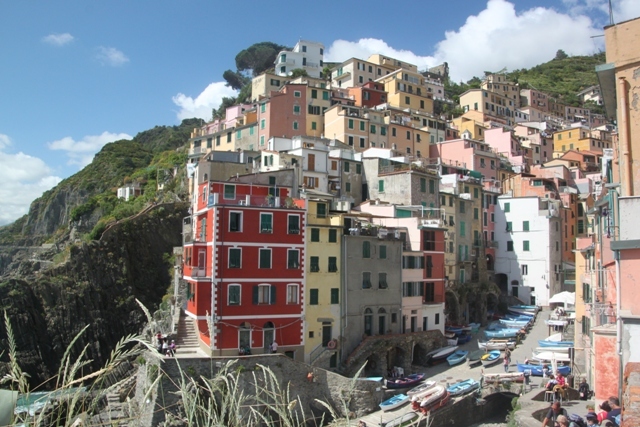 Loved Cinque Terre – would return in a heartbeat to the region and anywhere in Italy really! I do wish we had spent more time walking/hiking last time we visited. I know what you mean, I love anywhere in Italy too! The hiking for us was the real highlight here, if you go back definitely try and do some of that. The views from the trails are unbelievable. It really is – I took so many photos, round every corner is something out of this world. Simply beautiful! Thank you for sharing these gorgeous photos! Thank you Erika – it’s probably one of the most beautiful places I have ever visited. I bet… this is so unique! I am so happy for you that you were there! Haha Rick Steves definitely had something to do with it…but it’s nice to know these communities maintain their charm even with all the tourists! He has got a lot to answer for – we saw a serious amount of Rick Steves guidebooks everywhere in the Cinque Terre. Still yes, the whole place despite being a tourist haven still has its unique feel and atmosphere. Love cinque terre! Wish I can be there someday. Great pictures! Oh it is so beautiful – think you would love trying out the food there too! Also highly recommended. I don’t think views get better than these!! 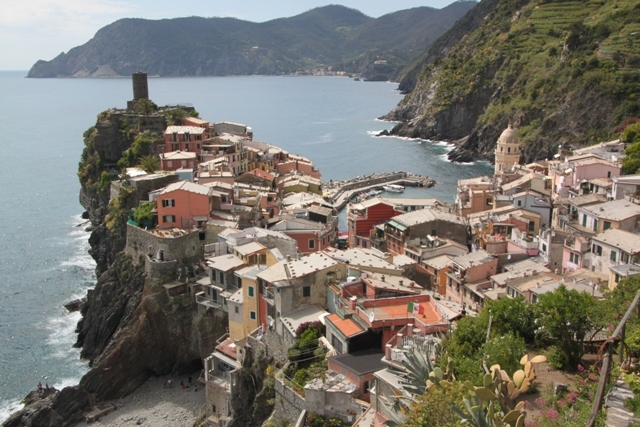 Cinque Terre has been on our bucket list for so long… we are so looking forward to visit it! Hope you get to go there sometime in the not too distant future! I don’t think you will be disappointed, it’s so beautiful. Looking forward to reading about it Genevieve! Weather was really sunny with blue skies on our visit, but don’t think the weather could spoil it here, it’s far too beautiful. It’s funny isn’t it, we complain about the tourists and crowds but then we’re part of that too!! I went to Pisa years ago and didn’t even know the Cinque Terre existed back then. (before the internet) My loss it seems. Great shots of the scenery as usual. I’m with you on that – didn’t really know much about it until this trip to be honest. Glad I started to read travel blogs – it is such a gorgeous spot! Thanks for bringing back cherished memories of our Cinque Terre visits. Such a unique, colourful part of Italy’s coastline. I especially love the ferry ride in good weather for a panorama of the towns from water. Monterosso was our favourite place to stay as it felt a little less crowded. As you mentioned though, the summer months are swarming with tourists! Glad it was a memorable experience for you. We loved it there Sian – the tourists are definitely out in force, however on a later part of the trip when we reached Florence then we realised what crowds really were!! We didn’t get to ride the ferry, really wanted to but rough seas meant it was cancelled. I’m sure the views from the sea would have been amazing – another reason to go back! It is so beautiful – even more so than any photo could show. We loved it but I totally get what you’re saying about those buildings, perched on the edge of rocks they don’t look stable (although they must be!!). I’m not too keen on heights but the walkways felt pretty safe and I wasn’t worrying – maybe it was climbing all the steps had me thinking about something else!! I visited one April with a friend in a backpacking trip after college. It was by far one of my favorite stops. We still talk and laugh about our adventures there. Glad to hear it’s family friend because I’ve always wanted to go back. We loved it too, as a family we thought it was just the perfect destination, you should definitely go back!! Thank you Rosemary – not surprised at all your friend was overwhelmed, I thought this was one of the most beautiful places I’ve ever been. Some paths were closed but we felt totally safe, although not so sure if there were heavy rains how I would feel! Addicted to travel blogs, that’s me now – on the plus side I’m finding out about so many new places, but the flip side is my list just gets longer and longer. Love your story, love the ending too! Thank you so much for the mention. Wow!!! Amazing views there. Another to add to the bucket list I guess! Definitely Heather, it wasn’t on our list but so glad we recently heard about it and managed to visit, it’s stunning! It is a diamond for sure Kamila, a really special place, glad it brought back good memories! Thank you – it’s a gorgeous place. Love the post! 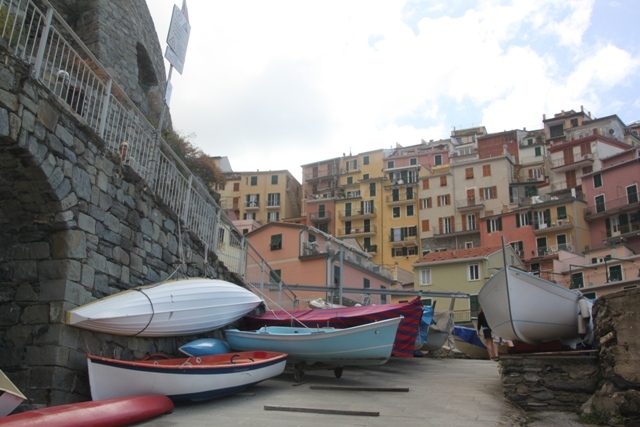 We did Cinque Terre in October and although the weather was C-O-L-D it wasn’t as nose to tail with the touristas. It is such a special place. Thank you! We had great weather but stacks of tourists – guess you can’t have it both ways. Still, completely agree that this is a special place. Maybe one day we’ll make it to Cinque Terre, this year it was Rome and the Amalfi coast. Similarly stunning, I believe. Thanks for checking out my website. It is stunning Jaclyn – never been to Amalfi yet, but definitely on my list! This is on my bucket list! “Beautiful Ruins” is a great book set in this part of Italy. One of my all-time favorite novels. The author is Jess Walter. Thank you for the book tip – will definitely be looking that one out! I always like to read a book set in the place I am exploring, shame I didn’t know about this before we went here, but looking forward to reading nonetheless. Thank you! We had a superb time exploring this gorgeous area, hope you enjoy it too! Now I have a new place to on my list. It’s beautiful Yvonne, definitely worth a spot on the list!! Definitely – one of the most beautiful places I’ve ever been. It’s beautiful, well worthy of a top spot on any bucket list! Thanks for dropping by. Thanks for dropping by here!! We had a bit of an apartment disaster in the Cinque Terre, not quite so bad as your experience though! So I had much sympathy!! You’ve really bought the photos out with your words. my next year Italian holiday would most likely include Cinque Terre, thanks to you. It’s the beautiful place for a holiday – we loved it and would definitely recommend!! I have to confess that the idea of visiting cinque terre came into my mind after reading your blog a few years ago ! Oh gosh, it was in 2014 ! Time is flying ! I got the idea from reading other people’s blogs, never really heard of it before!! We were supposed to go to Budapest, this was a back up when the flights got messed around but we had such a great time. I can’t believe it was 2014 either – eek!! !